On this magnificent cruise vacation, enjoy seeing some of Central Europe’s splendid capitals—Budapest, Bratislava, Vienna, and Prague—as well as many small towns that dot the landscape along the way. Shop for paprika in Budapest, visit St. Martin’s Cathedral in Bratislava, savor a Sachertorte in Vienna, and explore the grounds of majestic Hradcany Castle in Prague. In addition to these amazing and fun cities, there’s even more… enjoy wine tasting in Austria’s Wachau Valley, visit Austria’s oldest theater still holding regular performances in the resort town of Grein, and visit one of Europe’s largest and most spectacular monasteries at Melk. Explore Germany’s Passau, located at the confluence of three rivers, and Linz, Austria’s third-largest city. Guided sightseeing with Certified Local Guides in each city is sure to heighten your experience. Spanning the banks of the Danube, Budapest is one of Eastern Europe’s liveliest cities. Whether you’re seeing the sights, shopping for handcrafted embroidery or Herend porcelain, or basking in the coffee house culture over a rich cream cake in the renowned Gerbeaud Café, Budapest’s unique energy is positively palatable. 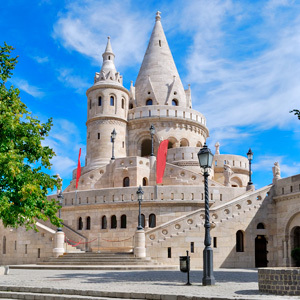 On your GUIDED TOUR of the city, see Heroes’ Square as well as the massive hilltop castle complex with its remarkable Fishermen’s Bastion and 11th-century Matthias Church, the coronation spot of several Hungarian monarchs. Be sure to take note of the city’s eight bridges—many famous sights in and of themselves—which connect ancient Buda on the right bank with Pest on the left. You may even want to walk across Chain Bridge, built in 1849 and a symbol of Budapest. During your free time this afternoon, perhaps visit St. Stephen’s Basilica, with marvelous views of the city from its viewing platform, or stroll along Váci utca, the main shopping street. Today you can explore this vibrant city at your own pace. Shop at the Great Market Hall and purchase paprika or embroidery at one of its 180 vendor stalls, or wander around the Royal Palace grounds. In the afternoon, transfer to your river cruise vessel and meet your crew at a welcome reception. This morning, enjoy the beautiful scenery on both banks of the Danube. As you cruise upriver, Hungary is on your left and Slovakia is on your right. The two countries share the Danube for a 58-mile stretch, with the border in the middle of the river. At the foothills of the Carpathian Mountains is Bratislava, the dynamic capital of Slovakia, which you reach in mid-morning. Join a LOCAL GUIDE to explore its fascinating Old Town, where winding cobblestone streets and narrow alleyways twist and turn to reveal the Town Hall, one of the oldest stone buildings in the city; and gothic ST. MARTIN’S CATHEDRAL, coronation church for the Kingdom of Hungary from the 16th to 19th centuries. A morning of cruising allows you to relax on board before reaching Vienna around lunchtime. Known as the “City of Music,” Vienna inspired the creative genius of Mozart, Beethoven, and Strauss. Once the center of the mighty Habsburg Empire, Austria’s magical capital on the blue Danube is a showcase of gilded architecture. This is home to the lavish Hofburg Imperial Palace complex with its Vienna Boys’ Choir and dazzling Lipizzaner stallions; the neo-renaissance Vienna Opera House; and awe-inspiring St. Stephen’s Cathedral—plus, countless other sights you’ll see on your GUIDED SIGHTSEEING TOUR. Stroll through the pedestrian Kärntnerstrasse, and be sure to take a break and enjoy a piece of decadent Sachertorte or Apfelstrudel in a neighborhood café. An optional concert is available tonight. This morning, the choice is yours with “VIENNA A LA CARTE.” Choose to visit one of a number of museums, such as the Kunsthistorisches Museum (Museum of Fine Arts), or the Schatzkammer (Treasury). Your Cruise Director will give you details of what’s on offer. The afternoon is at leisure. This morning, sail into the picturesque Wachau Valley, a UNESCO World Heritage Site. Pass the magnificent baroque Stiftskirche with its blue façade, the landmark of Dürnstein, before arriving in Weissenkirchen (White Church). Join a GUIDED WALK to learn more about this pretty little Wachau valley town, then, reboard your ship and sail to Melk. An afternoon GUIDED VISIT of the magnificent BENEDICTINE ABBEY acquaints you with one of Europe’s largest monasteries. The abbey houses an ornate library with over 80,000 printed books and 2,000 manuscripts. Words cannot describe the splendor of the church with its frescoed ceilings, stunning high altar, marble statues, and 210-foot-high cupola. This evening, you’ll be able to sample some of the FAMOUS WINES. This morning, arrive in the attractive country resort of Grein, nestled at the foot of a bluff in the shadow of its castle. After breakfast, take a GUIDED WALK through the town and visit its unique historical THEATER, the oldest in Austria still holding regular performances. A behind-the-scenes peek to learn about some of the curiosities of this Rococo-style, 167-seat theater will certainly tell you much about life as it was—and as it now is in this small town. Then, spend a lazy afternoon on board the ship, watching the peaceful views of the passing riverscapes from the comfort of the Sky Deck on your way to Linz. Austria’s third-largest city, Linz is an important river port where culture plays a significant role in everyday life. Composer Anton Bruckner lived here, and Mozart’s Linzer Symphony was composed in the city. There is free time to explore Linz on your own. See the 13th-century Hauptplatz, Austria’s largest medieval square, and the Trinity Column, built in 1723 as thanks for the city escaping the ravages of the plague, war, and fire. Perhaps wander around the old castle grounds and take in the beautiful views of the river, or visit the neo-gothic New Cathedral, Austria’s largest church, with capacity for 20,000 visitors. This afternoon, arrive in Passau, located at the confluence of the Rivers Inn, Ilz, and Danube. This is a city of graceful arcades and cobblestone streets. St. Stephen’s Cathedral houses one of the world’s largest church organs with more than 17,000 pipes. Join a Local Guide for a WALKING TOUR through this charming town, and find out much more about the “City of Three Rivers.” Alternatively, you might choose to join one of several full-day optional excursions departing from Linz: to medieval Český Krumlov in the Czech Republic, a UNESCO World Heritage Site; to Salzburg with its Sound of Music sites; or the popular “Romantic Austria” tour. Rejoin your ship in the late afternoon in Passau. Today, say goodbye to your crew and to Bavaria, then travel by motorcoach to Prague, also known as the “Golden City” and capital of the Czech Republic. Prague is a 1,200-year-old city preserved in time, and, unlike other Central European capitals, it was not bombed during the 20th-century wars. A LOCAL GUIDE will show you its best-known treasures, such as the Old Town’s Astronomical Clock, built in 1410 and once the envy of all of Europe; HRADCANY CASTLE GROUNDS; St. Vitus Cathedral; and the Charles Bridge, the oldest bridge in Prague. Browse the shops for hand-cut crystal or art books. Mix with the locals in Wenceslaus Square, an important meeting point where people demonstrated against the communist regime; watch performers and shop at the market stalls on Charles Bridge; sample the local plum dumplings and Pilsner; stroll along the Vltava River; or wander around Prague’s medieval Old Town, dating from the 10th century. Attend an onboard performance of Slovakian & International music. Striking Atrium-style 11-story Hotel located in city center, on the right bank of Vltava River, near Nove Mesto & Josefov. A contemporary 303 room hotel offering classic art deco inspired luxury. Free Wi-Fi internet access is available in the lobby, access in the rooms is subject to a fee (payable locally). There is also an indoor swimming pool and fitness center and the stylish restaurant offers an innovative mix of European cuisine with Asian flavors. Snacks, drinks and cocktails are served throughout the day in the lounge bar. Gold & Glamorous: “Belle Epoques” of Budapest Travel back in time with your guide; join a short coach trip along the Danube embankment with a short walk to one of the hidden treasures of Budapest, the House of Hungarian Art Nouveau. It houses a unique exhibition representing the refined world of Art Nouveau, including paintings, furniture, decorative objects and interiors, to give an insight into the atmosphere of middle-class life in Budapest in the “happy pre-war times”. The second stop of your tour is the “musical jewelry box” of Pest, the Hungarian State Opera House. The building enchants not only lovers of opera and ballet, but everyone who is amazed by the fine neo-Renaissance architecture. Following the visit you will be treated to coffee and cake in the Book Café, in the glamorous main hall of the Paris Department Store, one of the hidden secrets of the city. Sip your coffee and taste a fine delicacy of Hungarian confectioners in this glossy literary cafe with glittering chandeliers and flamboyant ceiling frescoes, painted by the same artist whose masterpieces raise the splendor of the State Opera House, Parliament and several other public buildings. This tour is a must for any passionate photographer as there are plenty of fantastic photo opportunities. Hungarian Food and Wine Pairing Dinner Explore and enjoy the very best of Hungarian cuisine with expert pairings of native wines from the country’s top regions. The Hungarian Violins at times with melancholy and in the next moment hot and spicy like paprika is something that is so typical for Hungary. A Gypsy band will entertain you while a chef and a sommelier will guide you through an extraordinary Hungarian culinary journey. A Visit of Schonbrunn Imperial Palace Schonbrunn, the former summer residence of the Imperial family, is considered one of the most beautiful baroque palaces in Europe. The Habsburgs resided here for the better part of the year in numerous rooms to house the large Imperial family. Emperor Franz Joseph, who later married the enchanting Sissi and reigned from 1848 to 1916, was born here in 1830. The monarch spent his last years entirely in the palace, which became the property of the new Republic of Austria only two years after his death. Today, the palace is part of UNESCO’s cultural heritage due to its historic importance, unique grounds and splendid furnishings. Follow our local expert and visit Empress Sissi’s former summer residence, afterwards take your time to stroll through the park and enjoy the impressive gardens. Royal Waltz Concert Don’t miss a truly magical evening in Vienna, featuring the most famous opera Arias by Mozart, Strauss Waltzes, polkas and operetta excerpts from “Die Fledermaus” by Johann Strauss, “The Merry Widow” by Franz Lehar, the Blue Danube waltz, the Radetzky March and many others, performed by a brilliant cast of top European singers, beautifully costumed dancers and the Original Wiener Salon Orchestra. A true celebration of joy and optimism featuring familiar music, combined with dance and storytelling that recalls happy memories of a time when music helped to shape the city of Vienna: a city of world-class artistry and a true flair for celebration. Cesky Krumlov – a sleeping beauty awakes Take a scenic route across the rolling hills of Upper Austria and Bohemia to one of the most beautiful, charming and romantic little towns that is to be found in Europe. For centuries, this small town has enjoyed the reputation of being the “Pearl of the Bohemian Forest”, an extraordinary fortified town built by princes and bishops on the most beautiful bend of the Vltava River. This hidden gem of European history remains as it was centuries ago, a colorful place with over 300 historic buildings, small lanes, art galleries, charming shops and medieval inns; a truly stunning experience. When after WW II the Iron Curtain descended across eastern Europe, Cesky Krumlov found itself even more off the beaten track, with hardly a visitor finding his way there. Our local experts will guide you back in time. Pass by the Vltava (Moldau) River, which was immortalized by Friedrich Smetana’s composition of the same name, before you return to your ship with happy memories from this UNESCO World Heritage Site. Romantic Austria – a Countryside Excursion to the Salzkammergut Lake District The picturesque mountain lakes, the luscious green of the hills and fields, striking mountain cliffs and romantic villages – these are just a few reasons that for centuries attracted countless writers, composers and creative artists to find inspiration in the magnificent landscape of the Salzkammergut region, shared between the provinces of Salzburg, Upper Austria and Styria – the famous Austrian Lake District. The literal translation of the Salzkammergut is “salt chamber estate” and refers to an area where salt was mined and which was formerly under the control of the Imperial Chamber in Vienna. Today, the term has developed into a brand name for one of the loveliest holiday regions of Central Europe with over 70 lakes, which are of drinking water quality and range in color from turquoise to emerald green. Let us reveal to you the unspoiled beauty of Gmunden and St. Wolgang region and some of the most panoramic routes in Austria. Salzburg – Sound of Music Picturesquely located at the foothills of the Alps the city is known as the birth-place of Mozart. Salzburg is also the setting for the Sound of Music movie, which has shaped the city’s perception in the minds of generations. But Salzburg is much more. It is a wealthy city with history based on the salt trade from the nearby Alpine Mountains-a city full of beautiful baroque buildings, nestled between the mountains and green waters of the Salzach River. In your free time strolling through the small but busy lanes with their wrought iron signs, using a cable car to ride up to the castle on the hill for views, or just passing time by relaxing on one of the many terraces makes you feel part of the scenery. On our scenic ride by coach you will admire the beauty of the region. Our dedicated local experts will talk about and show you the city, and relive scenes from the Sound of Music. After free time we shall also visit the church at Mondsee where the “von Trapps” were married. Dinner and Folklore Show The Czech have their way of fun where food, drinks and traditions come together. At long rows of tables you will be served the traditional hearty Czech cuisine where the drinks and the laughter flow. On the small stage musicians will play on the hammer-dulcimer, the fujara (shepherd’s flute) and the bag-pipe, all part of their musical heritage. The performers in their traditional costumes will treat you to local dances and their folk songs from Bohemia, Moravia and Slovakia, which will impress you. Experience excellent dancers, vibrant music and take away wonderful memories of your trip to Prague. Join in for an evening of food and fun in one of Prague’s typical restaurants – a Czech traditional 3-course dinner with drinks; guide services and transportation are all included. Prague’s Secrets Revealed This tour will add to the included city tour as it is quite possible to escape the touristy side of Prague and just as before, it requires knowing just which street to turn down or even which unsigned walkway to pass. Knowing where to turn from the Old Town Square, you can leave all the crowds behind and find yourself shockingly alone in a twisting medieval street, quiet as can be – with only the sound of your shoes clicking on the cobblestones or a tram swooshing by a few streets away. And in this street, it’s also still possible to find the most interesting places when you least expect them. The houses and doors often look the same from the outside. To the naked eye, the street may even seem residential. There are no big flashing lights pointing out the history that lies behind these facades of Prague. It needs a local expert, who shows you these secrets and tell you the stories of what happened here and there. Prague Secrets Tour leads us to the Charles Bridge and Mala Strana, which according to the locals is Prague`s most romantic and picturesque part of the protected city center. Tasting Bohemian Wines Venture into the beautiful Bohemian countryside this morning and discover Castle Melnik, a genuine Jewel of Bohemia. The Castle was the residence of the queen widows of Bohemia and Melnik became a royal city. In 1542 the castle was transformed into a Renaissance Jewel. This is a unique opportunity to have an inside visit of a medieval castle and see how the aristocracy lived in previous centuries. The surrounding vineyards of Melnik form part of the Czech wine region, one of the northern-most viticultural areas of Europe, and are the largest in Bohemia. The castle is still a partly lived-in property and you are invited to a special Bohemian wine- tasting with local cheese. This tour gives you a wonderful insight into the traditional values of the Bohemian upper class.